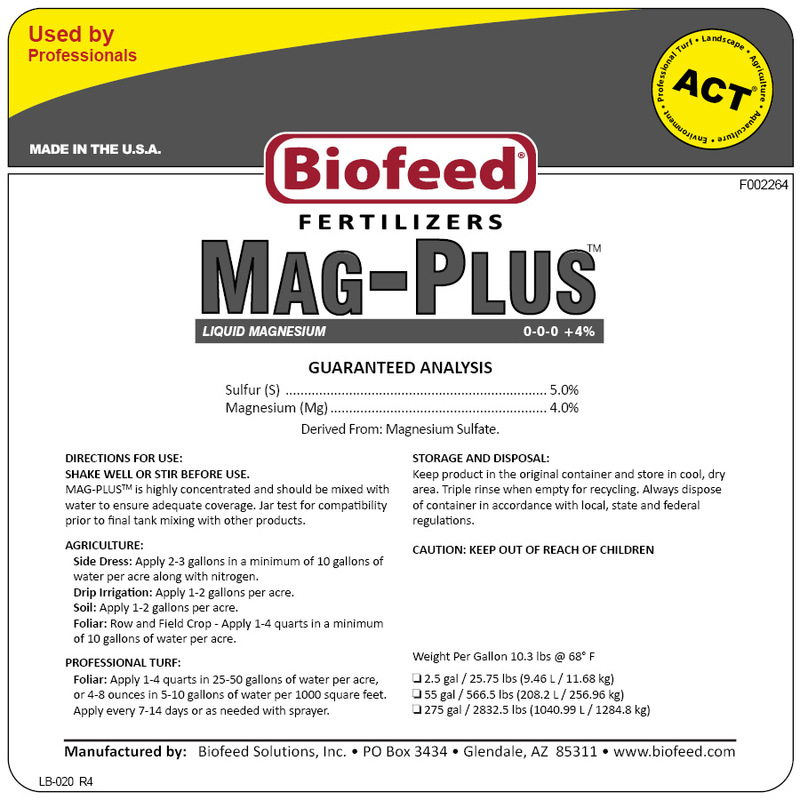 MAG-PLUS™ 0-0-0+4% – Biofeed Solutions, Inc.
MAG-PLUS™ provides crops with magnesium and ACT®. 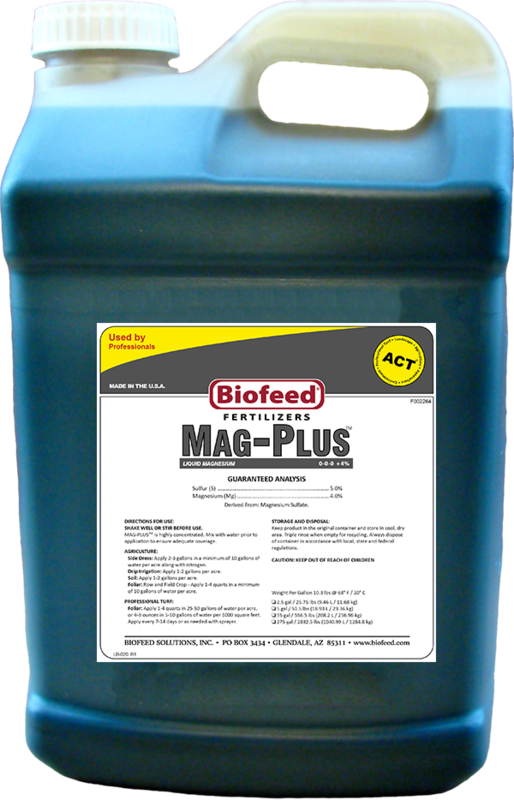 MAG-PLUS™ readily enters the plant through foliar or soil application to supplement deficiency by supplying plant available Magnesium. Magnesium (Mg) is one of 18 nutrients essential for plant growth. It is actively involved in photosynthesis as the central element of the chlorophyll molecule. Magnesium plays an important role in plant respiration and energy metabolism. Also contains non-plant food ingredients; (ACT) including; natural organic acids, surfactants, enzymes, amino acids, biostimulants, and buffers. SHAKE WELL OR STIR BEFORE USE. MAG-PLUS™ is highly concentrated and should be mixed with water to ensure adequate coverage. Jar test for compatibility prior to final tank mixing with other products. Side dress: Apply 2-3 gallons in a minimum of 10 gallons of water per acre along with nitrogen. Drip irrigation: Apply 1-2 gallons per acre. Soil: Apply 1-2 gallons per acre. Foliar: Row and Field Crops – Apply 1-4 quarts in a minimum of 10 gal of water per acre. Foliar: Apply 1-4 quart in 25-50 gallons of water per acre, or 4-8 ounces in 5-10 gallons of water per 1000 square feet. Apply every 7-14 days or as needed with sprayer.